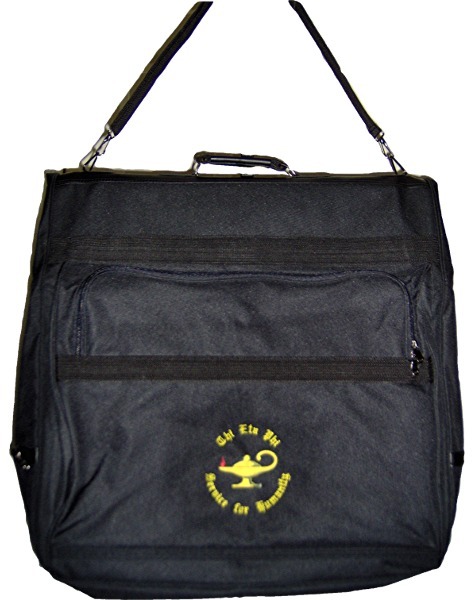 This large, sturdy , beautifully embroidered hanging garment bag holds your long dresses and suits, and their hangers. It features a full length zipper, two shoe pockets inside the folded bag, and two large pockets outside of the folded bag. Hold it by handle or carry strap. This bag measures 52"x 20" when open. Choose from two designs - Lamp or Turtle. Perfect with our rolling duffel bag!